The last time Everton had to scrimp and save, they didn’t buy a ship called dignity. They bought Lu-ka-ku. The 53 league goals in 110 appearances that followed, coupled with the 75 (90?) million quid we got for him to flounce his way down the East Lancs will show that to be a superb bit of business. Cast your mind back. We’d had him on loan for a year, Roberto’s first year. It was a time of excitement, of purpose. We had an identity. We were happy to just bring in Gareth Barry on a permanent, Samuel Eto’o on a free, and Muhamed Bešić- modest business, because it meant we got Lukaku, and we were going to build on what went before. The improvement never came, we stagnated, and Martinez was gone within two years. Hopes were raised again when Iranian billionaire Farhad Moshiri became the major shareholder in early 2016. But things haven’t been smooth sailing aboard the ship called EFC. Moshiri brought Koeman and Walsh to the club, Koeman arriving with a better win % rate at Southampton than Mauricio Pochettino, and Walsh- not known particularly well to most of us- was widely credited by talking heads as a driving force behind Leicester’s recruitment for their remarkable title winning season. Now, there’s something to be said for it being difficult to bridge the gap between where we were and what was above. It’s fair to say since buying Man City in 2008, Sheikh Mansour had to buy his share of Gareth Barry’s and Craig Bellamy’s before the likes of Kevin De Bruyne came along. It’s also true to say after two full summer windows (3 including the remainder of the first summer window, having bought City in August 2008), Sheikh Mansour was watching- amongst others- Carlos Tevez, David Silva, Yaya Touré, and Vincent Kompany, who each played a major part in City’s first Premier League title within 4 years, and their lasting success since. Now, for context’s sake, it isn’t fair to expect Moshiri to do anything like what Sheikh Mansour has done- this is in no way a criticism of Moshiri- he doesn’t have those kinds of resources. But by the same token, it means we need to be thoughtful about what we do with our money, because there won’t be an endless pot. After two full summers between Koeman and Walsh, what does Moshiri have to show for the investment and trust he placed into both? Gueye (7 million), Bolasie (25 million), Williams (12 million), Lookman (7 million), Schneiderlin (24 million), Klaassen (24 million), Pickford (30 million), Keane (25 million), Sandro (5 million), Onyekuru (7 million), Vlašić (10 million), Sigurðsson (45 million). Gueye’s been a good signing, Bolasie has been injured- but whether he would ever have proven worthy of his price is iffy, Onyekuru- who knows? Pickford has done well. The rest? Williams form has had more downs (and the occasional up) than yer da’s foray into the Forex market on the trading app on his new phone. Lookman and Vlašić? Neither deemed worthy of any meaningful minutes in a dreadful season. Vlašić has seen the pitch for 10% of league minutes we’ve played, Lookman? 8%. Schneiderlin? The lad who’s literally made more statements on his Instagram about not being sent home from training than he’s managed to make on the pitch in the best part of a year. Oh, and while we’re at it- accepting the offer to piss off inside if you’re not taking training seriously doesn’t make you less of a prick because you haven’t technically been sent home from training & it speaks volumes that your media performance since that episode to try and save face only ranks about 15th in your list of embarrassing performances this season. Unprofessional dickhead. Klaassen? Who scouted him? He’s got a brain, but did they think his complete lack of athleticism wasn’t going to become apparent in the Prem? I don’t know quite what to make of Keane yet, hopefully the new manager can get him back to basics, but he’s moved like a fridge-freezer for some opposition breaks/goals – more than I’d frankly care to see from my centre-half. Sandro- they don’t know what to do with him- again, who scouted him? They haven’t had the faintest idea how to play the poor lad, and haven’t helped him with the minutes they have given him from time to time. At least we’ll get our money back on him. We spent far too long in the summer chasing Sigurðsson, although he’s obviously a talented player. Sigurðsson completed the ill-conceived spending of the Koeman era. Unlike the poised, thoughtful purchasing of the past, Everton had along the way become a side spending money like a student receiving their first student loan into the bank. Without thought we stocked up on 10’s- Rooney, on a free, added into the mix to join Sigurðsson, Klaassen, and Barkley, the embodiment of a student (flush with their loan money) on a run to Costco, returning with 100 pot noodles and nowhere to store them in their student dorms. Klaassen was the four pack of beef and tomato stuffed above the wardrobe. We had no way to get all of them into our team, and our form suffered so starkly from both our summer spending- and our lack of spending at centre forward, on the wing, full-backs and centre-half, that the malaise was so gripping, the ‘r’ word was being muttered at a possibility, for the first time in over a decade. It isn’t that Everton have struggled to bridge the gap, it’s that we’re actually worse off for the last couple of years. We’ve had the third best right-back at the club playing left-back, a kid playing right-back, a kid playing centre-half, an out-of-form kid playing centre midfield (who has been getting the crowd on his back, but they’ve had to keep playing him because of the failures of those responsible for recruitment), and a kid leading the line on his own. We were badly unprepared for this season. The ship called EFC was adrift, rudderless, and Koeman was thrown overboard, sans dignity. Koeman was supposed to bring a ruthlessness that our underperforming squad needed, and be a ‘name’ in “The Hollywood of football” as Moshiri put it. The ‘ruthlessness’ that Moshiri, that we all eulogised about, that was supposed to be his biggest strength, was in fact a huge weakness. Now, we’ve a manager without the name Moshiri thought he wanted for us to compete in the “Hollywood of football”- two years on and further contradictions, if not confusion. A steady sort, Allardyce has already righted the ship and done as much as could be reasonably asked of him at this stage. As for Walsh, the mysterious figure who we still don’t know much about or how his role works- he skates upon thin ice. The kids on the wings- with as much promise as we as fans have thought they’ve had, have not been fancied by successive managers. Klaassen isn’t making the bench, and frequently neither is Sandro, either. You get the point- a man whose sole remit has been to buy players… Has, simply put, not bought well. To be fair, criticising Walsh can be tricky, because we just don’t know the dynamic behind the scenes. 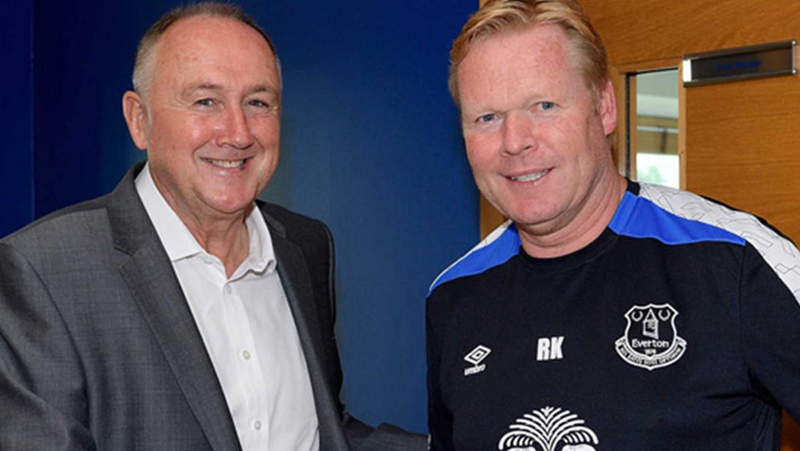 He may have presented three or four players in positions of need to Koeman, and you wouldn’t put it past Koeman- not lifting his head from his desk, extending a fist and giving Walsh a thumbs down like an emperor as he half-listened to the list of options. Koeman was stubborn and single minded- it may be that if it wasn’t Giroud he wanted nobody, same with Klaassen, and so on. Walsh doesn’t have that luxury as an excuse now, he was supposed to favour Allardyce, and he’s hitched his cart to him. If Allardyce does well, and they sign well, the pressure will ease, but given many don’t expect Allardyce to be at the club within a year or two, all eyes are on Walsh, now- starting with Cenk Tosun. All that matters to us as fans is that situations like those we’ve had over the past 12 months can’t be allowed to continue into 2018.